DAMASCUS (Sputnik) - The militia of the Syrian city of Raqqa fired mortars on the US-led coalition base in the town of Ayn Issa, the press service of the movement said on Monday. 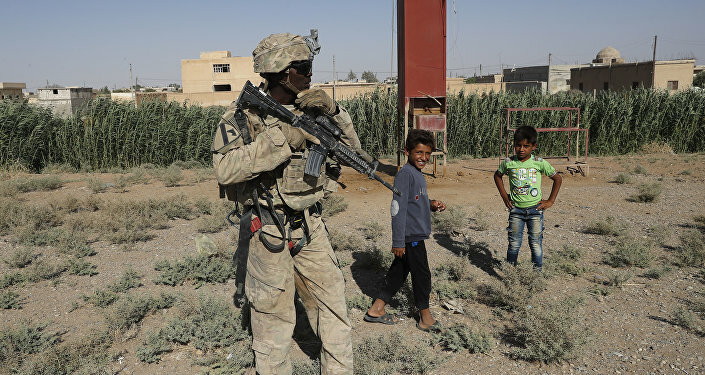 "Following the intelligence activities, the militia of Raqqa waged a special operation targeting the US Staff located at the former base of the 93rd Brigade in the district of Ayn Issa, 43 miles north of Raqqa. Several mortar shells were fired on individual targets without any casualties on our side," the statement said. The militia noted that they do not tolerate "the occupational forces" of the United States, Turkey, and their allies in northern Syria. The statement read: "Do not relax night and day, wherever you are." On March 25, the indigenous Arab population launched an uprising against armed groups supported by the United States in the town of Al-Mansura in the suburbs of Syria's Raqqa, opposing a forced mobilization conducted by the Syrian Democratic Forces and local self-governing bodies appointed by the United States. The uprising came as result of a 4-year-long military campaign, carried out by the United States and its allies against Daesh* in Syria, without the approval of neither the Syrian official government, nor the United Nations. Last October, the coalition drove Daesh out of Raqqa that had been previously served as the de facto capital of the terrorist group's self-declared caliphate. According to the United Nations, the humanitarian situation in the city is disastrous and the infrastructure is completely destroyed.